On Monday, January 9th, 2017, we launched our session two FREE Online Mathematics tutoring for kids in Brooklyn and New York State. Due to our session one experience, we made two simple changes to this program. First, the time per session decreased from 35 minutes to 30 minutes. We found shorter time spans worked best with our kids. Plus, the sessions could add five or ten more minutes as needed by the kids. Second, each day the program starts later (4:30 PM) and ends late (7:15 PM). We found children's school days end at best by 4 PM. Also, children participate in afterschool programs which end at 6 PM. Thus, parents see the online tutoring as a convenient supplement or addition to their child's educational programming. Finally, our kids have that want to and (bigly) desire to learn online. As such, at eight and nine years old, they are super responsible kids. For instance, they log onto our BrainCert platform at a set time every day. This is Brooklyn Learning Lab's online tutoring experience and we will update this memoir. This is Brooklyn Learning Lab's online tutoring experience so far and we will update this memoir as we see fit. Keep up the good work! Time is definitely important and time have a way of bringing all things to fruition. 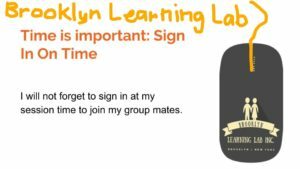 So will the Brooklyn Learning Lab.